Monarch Air Group provides private air charter in Albany, NY. Our clients benefit from top-notch service, unrelenting dedication to safety, wide selection of aircraft, and years of experience in chartering private jets. To obtain a free quote, please use our online quoting tool provided below, or call toll free 1-877-281-3051. Monarch Air Group offers private jet charter services to and from Albany, NY, USA. Situated right on the banks of the mighty Hudson River, the city of Albany is New York State’s historic Capital City. Located only 136 miles north of New York City Albany is easy accessible by all modes of transportation. There are many historic sites, amazing attractions, family-friendly amenities, entertaining events, beautiful museums, unique galleries, gripping architecture, and luxurious restaurants. 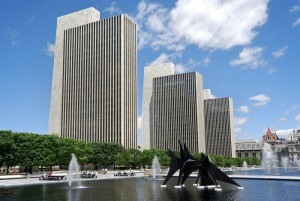 While being in this great New York State Capitol be sure to visit the Empire State Plaza – one of the most famous tourist attractions drawing tourists from all over the world.